Zwan is commemorating the international hot dog day with a massive outdoor campaign. I managed to get images of 2 of the 4 visuals, but you get the gist. Basically they are love messages from a sandwich bun to the hot dog itself. I think the most interesting one is not seen here and goes "without you my heart is empty" (with heart in Arabic meaning "alb" which doubles are the interior part of anything). 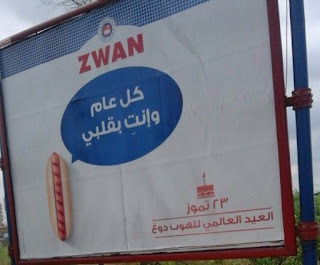 Zwan usually goes all out on the back to school season so it is interesting to see it displayed way before that! What I appreciate the most about these visuals is the blue-white clean esthetic which Zwan basically stuck to which delivers the message without overdoing it!